A: Regular cleaning of your beer lines, faucet, and keg coupler is crucial for maintaining a sanitary environment, preventing the build-up of yeast, mold, and bacteria. This regular cleaning assures that bacteria does not have the opportunity to reach levels that might cause off-flavors and shorten the shelf life of your beer. Line cleaning with the proper equipment and chemicals will also eliminate the build-up of calcium oxalate or "beer stone", a mineral deposit that builds up when dispensing draft beer. If left unchecked, these beer stones can flake off into your beer causing an off taste, as well as creating an unsanitary surface that can harbor microorganisms. A: In commercial environments, line cleaning should be performed at least once every two weeks. For home environments that may not cycle through as much beer and have a much shorter beer line, we recommend that you clean your lines every time you switch out a keg or every five weeks, whichever is shorter. Q: How do I clean my lines? 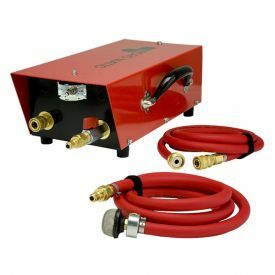 A: There are several different methods for cleaning beer lines, including hand pump cleaning kits, pressurized cleaning kits, and re-circulating cleaning pumps. Shut off your CO2 Regulator, untap the keg, and remove the beer line from your keg coupler. Attach the beer line to the cleaning kit coupler. Pour the measured amount of the cleaning chemical into the open cleaning bottle, following the manufacturer's specifications on the label. Add water as directed, ensuring that you do not overfill the container. Insert the pump and twist to tighten. Pump to pressurize the cleaning bottle. Place a bucket or pitcher under the faucet and open the faucet to allow the cleaning solution to flow through the line. Pump until dry. Rinse the cleaning bottle and fill it with clean, cool water and repeat the cleaning cycle to rinse the line of cleaning chemicals. Fill the cleaning bottle with line cleaner solution. Secure the bottle cap onto the mouth. 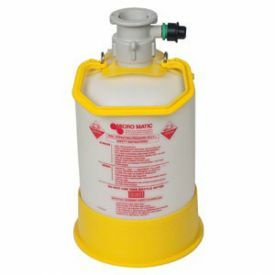 Detach the keg coupler from your keg and attach it to the cleaning bottle cap, tapping it as if it were a keg. Place a bucket or pitcher under the faucet to catch the cleaning fluid and pull forward on your faucet handle to begin. Your CO2 canister will force the cleaning solution through the keg coupler, through the beer lines, out of your faucet and into the bucket. 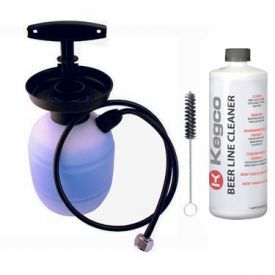 Connect keg couplers with cleaning cups or cleaning adapters. Fill a bucket with warm water and place the "in" hose into the water. Connect the "out" hose to the dispense system and turn the pump on, flushing beer out into a second bucket until the line runs clear with water. Rinse out this second bucket and refill with an appropriate line cleaning mixture. Place the "in" hose into this bucket, creating a closed loop. Turn the pump back on and allow this mixture to recirculate for a minimum of 15 minutes. Refill the first bucket with fresh cold water and place the "in" hose back in this bucket. Pump cold water from the first bucket into the second bucket to rinse the system, refilling the first bucket and dumping the second bucket as needed. No matter which cleaning method you use, be sure to soak the keg coupler and faucet in a mixture of water and cleaning chemicals, scrub them with a cleaning brush, and rinse them clean with water. This is also a good time to check that all parts are in good condition and do not need to be replaced.